Talk about a game of two halves! 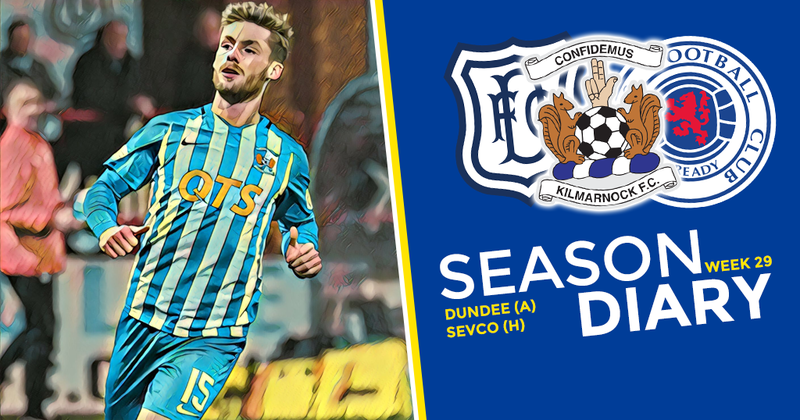 We got off to a terrible start midweek in Dundee and although Conor McAleny’s equaliser was a peach, we were guilty of some schoolboy defending. The Broadfoot/Findlay partnership was a wee bit rusty with big Kirk being out recently, and to be fair they did not get much help from the midfield. The second half saw us back to our best but a free kick into the top bin from Killie’s own Benjamin Button, Chris Burke, was as much as we could muster in goals terms, despite our dominance. A decent point away from home and it was to be another deserved draw in the Scottish Cup on Saturday against The Rangers. That will be seven times we get to play them this season, surely time for league restructure? Steve Clarke has quite rightly been calling for some refereeing consistency in the press. Sevco boss Slippy Gerrard assumed the comments were about his team and let fly with insults. He could clearly learn a thing or two about class and decorum from a professional like Clarke. Speaking of class, a quick mention for Daniel Bachmann for saving not one but two penalty kicks in back to back matches, the big man waited his turn and he oozes confidence and gives real steel to our back line.